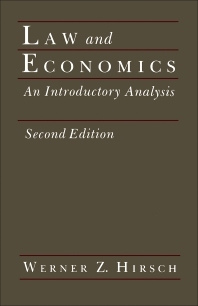 This second edition takes into account the major developments in economics and jurisprudence that have occurred since the publication of the first edition. A new chapter has been added on anti-discrimination law and such topics as adverse possession, rent control, medical malpractice, product reliability, and defense against criminal prosecution have been reexamined in the light of new theoretical developments and case studies. Environmental law and a careful comparison of alternative methods to control the environment are included. Introduction. Nature and Origin of Laws. The Interface between Law and Economics. Where Law and Economics Might Not Meet. Entitlements and Externalities and the Role of the Law. Property Law's Basic Legal Premises. Introduction. Defining Rights and Entitlements to Property. Permanent Transfer of Rights and Entitlements. Temporary Transfer of Rights and Entitlements. Land Use Planning and Development. Conclusion. Economic Analysis of Landlord-Tenant Laws. Introduction. Habitability Laws. Rent Control Laws. Just-Cause Laws. Housing Subsidy Laws. Conclusion.Economic Analysis of Zoning Laws. Introduction. Residential—Commercial—Industrial Zoning Ordinances. Exclusionary Zoning. Inclusionary Zoning. Zoning as a Taking? Conclusion. Contract Law. Introduction. The Basic Legal Premises of Contract Law. Economic Considerations of contract Law. Conclusion. Tort Law's Basic Legal Premises. Introduction. What is a Tort? Negligence. Duty. Proximate Cause. Defenses. Liability Rules—Introductory Classification. The Rule of Contributory Negligence. The Rule of Comparative Negligence. The Rule of Strict Liability. Damages. Trends in Tort Law. Conclusion. Economic Analysis of Tort Law. Introduction. Economic Analysis of Medical Malpractice. Effects of Liability Standards. Some Economic Considerations of Product Liability. Economic Analysis of Accident Law. Reexamination of the Learned-Hand Formula within a Welfare Framework. Sovereign Immunity. Rules for Assigning Liability for Litigation Costs. Conclusion. Criminal Law. Introduction. Basic Legal Premises of Criminal Law. Economic Analysis of Criminal Law. Economic Estimates of Crime Deterrence. Conclusion. Environmental Law. Introduction. Environmental Externalities, Property Rights. Some Theoretical Considerations. Court-Made Environmental Law. The Fee Tax Alternative. The Subside Alternative. The Regulatory Alternative. Government Facilitated Internalization Requiring No Revenue. Publicly Negotiated Settlement. Government Facilitated Internalization Financed Through General Taxes. Comparing Alternatives. Conclusion. Antimonopoly Law. Introduction. The Economic Incentive to Monopolize Markets. Ways to Monopolize Markets: Many Roads Lead to Rome. A Brief Outline of Antimonopoly Acts. Horizontal Mergers. Cartels. Price Discrimination. Foreclosing Entry Through Vertical Integration and Advertising. Government-Induced Price Fixing and Foreclosure. Remedies.Discrimination Law. Introduction. Employment Discrimination Law. Housing Discrimination Law. Age Discrimination Law. Conclusion. Index. Professor Werner Z. Hirsch has been active in the field of Law and Economics since the early 1970s. Not only has he been active in the theoretical side of the field, but also in the practice of it by participating in the law-making process as an advisor and committee member on numerous occasions. In addition, he has served as an expert witness in a host of court cases, where he has given input on the economic rationale behind the laws. He is currently a professor in the UCLA Department of Economics, where his major interests lie in the fields of Law and Economics, Urban Economics, and Public Finance.